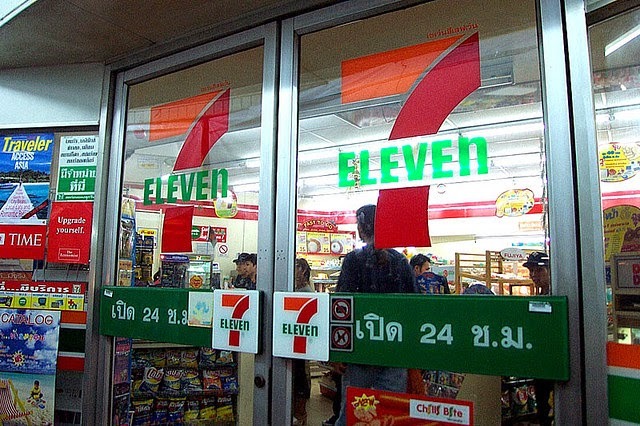 BANGKOK:– A spokesperson for the Immigration Bureau has announced that from today, foreigners will be able to complete their 90 day report at any 7-Eleven outlet in Thailand. This follows the recent announcement from Immigration that foreigners can also now complete their 90 day report online. Speaking at the launch event held at the immigration offices in Chaengwattana, Bangkok, Immigration chief Pol Col Somchai Wittiporn said: “this new service is being launched in preparation to Thailand’s integration with the ASEAN community”. “We also want to make it easier for the aliens who stay in Thailand for a long time”. “We know that many foreigners like to buy their cheap beer and bread and also collect the stamps from 7-Eleven, so it was our idea that they can also do their 90 day reporting when they visit their favourite store”. Pol Col Somchai explained that in order to complete their 90 day report at 7-Eleven, foreigners will need to hand their passport, 4 passport photos and the TM47 form to 7-Eleven staff who will then scan the relevant information into the new system. Pol Col Somchai also confirmed that due to some minor technical issues 7-Eleven staff are currently unable to issue a confirmation receipt for any 90 day report completed in store. However, whilst the problem is being rectified and as a gesture of goodwill, Pol Col Somchai has instructed staff to issue any foreigner who completes their day 90 report at 7-Eleven during the month of April with twenty complimentary 7-Eleven stamps courtesy of the Immigration Bureau. Trust me this is real and not an April Fool’s Day post!